The diagram of INA and the schematic illustration of its main functionalities. 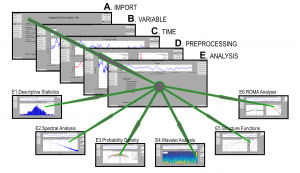 INA (Integrated Nonlinear Analysis) is an interactive software product designed to analyze satellite data with advanced nonlinear methods adapted to space plasma turbulence research. The software is developed in the framework of the European Community’s Seventh Framework Programme project STORM (Solar system plasma Turbulence: Observations, inteRmittency and Multifractals) where ISS had a significant contribution. The main developers are Dr. Costel Munteanu (scientist at the Institute of Space Science – ISS), Dr. Marius Echim (senior scientist at ISS and also at the Belgian Institute for Space Aeronomy (BISA), Brussels) and Dr. Peter Kovacs (senior scientist at the Geological and Geophysical Institute of Hungary, Budapest). INA is publicly available from the website of the project (http://www.storm-fp7.eu) as an executable file to be run under Windows or Linux operating systems. The download page is available after registration by email to marius.echim@oma.be. The software is written in MATLAB (version 2015a), but it can also be used independently by installing a MATLAB compiler, which can be downloaded freely from here. Through an intuitive graphical user interface (GUI), INA provides a complete statistical analysis of a time series and provides various methods: descriptive analysis, power spectral density (PSD), spectrogram analysis, analysis of probability distribution functions (PDF) of fluctuations, wavelet analysis, structure function analysis (SF), and multifractal analysis using the rank ordered multifractal analysis (ROMA). INA is optimized for the analysis of magnetic field and plasma data provided by Venus Express, Cluster and Ulysses satellites, but has also adequate modules for reading and analyzing other data types. For more information about INA, the software developers can be contacted directly by email: Dr. Marius Echim <marius.echim [at] oma [dot] be>, Dr. Costel Munteanu <costelm [at] spacescience [dot] ro>, Dr. Peter Kovacs <kovacs [dot] peter [at] mfgi [dot] hu>.